I was given the Deliciously Ella cookery book for my birthday and have already made a couple of things from it; I’m never going to be as health-conscious as she is, and certainly don’t think it’s likely that I will ever switch to a vegan or vegetarian diet, but it’s definitely good to switch things up and every now and then eat some super-healthy meat-free meals. I liked the idea of her zucchini noodles with a minted avocado sauce but I wasn’t quite brave enough to make the zucchini noodles – at least not at this point, because I don’t really like courgette but I also don’t really like avocado! But I do have a spiralizer and I reckon if I made a different sauce with the ‘courgetti’ (courgette spaghetti) it would be OK, so watch this space! I decided therefore to cook regular spaghetti but make the sauce as I have a lot of mint growing in my garden and love to find recipes I can use it in. As Ella says, this is a very rich, creamy pasta –I left out the mushrooms as I can’t stand them though Ella does say they add a “next level of deliciousness” so if you like mushrooms then do add them in. I chopped the nuts in a food processor and added the avocado, oil, lime, mint leaves and salt and blended until I had a chunky sauce. The beauty is that this doesn’t need to be cooked so it is so quick. It’s nice heated through a little so when I drained the pasta I returned it to the pan with the sauce. It was surprisingly good given I don’t really like avocado and I felt very virtuous! I'm sharing this with Meat Free Mondays, hosted by Jacqueline at Tinned Tomatoes. Jen's Food is hosting Extra Veg this month on behalf of Helen at Fuss Free Flavours and Michelle of Utterly Scrummy; this is a great way to eat some extra veg almost without noticing! 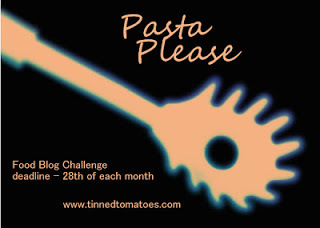 Emily at A Mummy Too is hosting Pasta Please on behalf of Jacqueline at Tinned Tomatoes so I'm sharing this recipe. I made a pasta sauce with avocado once and was surprised by how good it was. This sounds really tasty.